Sprinkle chicken thighs with a little salt and pepper. In a large nonstick pan, add the chicken and cook about 5 minutes or until brown, turning once. Remove chicken from pan to a plate. While the chicken is browning, place the mushrooms, onions, and both peppers in a large microwave-safe bowl. Cook in microwave for about 2-3 minutes until the vegetables are softened. In the same large pan, heat 1 tablespoon olive oil. Add garlic, softened mushrooms, onions and peppers. Saute on high heat until lightly browned and soft, about 3-4 minutes. Stir in wine and cook for about 1-2 minutes until wine is almost evaporated. Return chicken to pan and add the tomato sauce, Italian seasonings and fresh pepper. Bring to a boil, reduce heat and cook uncovered for about 15 minutes until chicken is tender and no longer pink. Here’s a wonderful recipe you can ciao down guilt-free! 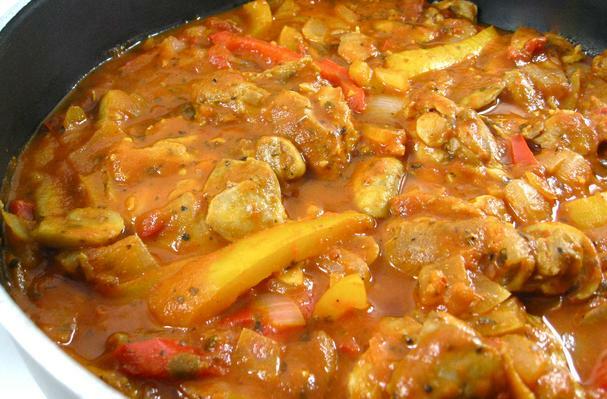 We’ve simmered chicken thighs in a rich tomatoey sauce loaded with mushrooms, onions and sweet peppers. It seems like boneless, skinless, chicken thighs are very popular to use in healthy recipes these days. Just by removing the skin and sauteing the veggies is a small amount of oil our delish dish has 270 calories, 10 grams of fat and 6 Weight Watchers POINTS PLUS. A regular recipe has 417 calories and 27 grams of fat. This hearty dish has become a family favorite of ours. Maximum flavor and minimum effort…Definitely impressive enough to serve to company. Buon Appetito!